I will review the notion of Nikulin involution on a K3 surface X. Then, I will discuss a special type of such involution, obtained from translations by a section of order-two in a Jacobin elliptic fibration. I will describe geometric constructions, periods, and moduli for K3 surfaces, by way of introduction to the more technical lectures by Thompson, Harder, and Clingher. Following the publication of the proof of the global Torelli theorem for K3 surfaces, it became evident that large portions of the theory of K3 surfaces and their moduli reduce to the theory of a specific even unimodular lattice of signature (3,19) and its associated orthogonal group. In this talk, I will discuss some basic lattice theory and outline how it can be used to prove geometric statements about K3 surfaces. Mirror pairs of certain Calabi-Yau manifolds defined over finite fields have their numbers of rational points closely related. In this talk I will explain p-adic techniques which can be used to count rational points on such mirror pairs. We will compare the the number of rational points on a manifold and its mirror modulo p.
of zeta functions for mirror pairs of Calabi-Yau manifolds defined over finite fields. We will introduce the notion of a modular form, with a focus on those forms which arise in an enumerative setting. We will outline the motivation and definition of Gromov-Witten invariants, with a particular focus on the Gromov-Witten theory of P2 and its role in counting plane curves. We will also try to talk about many of the interesting structures that come naturally from these constructions, and highlight the role of Calabi-Yau three-folds. I will discuss the construction of the moduli space of K3 surfaces and some of its properties, before moving on to talk about degenerations of K3 surfaces and the compactification problem. 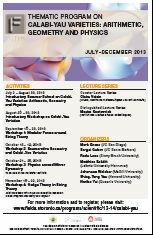 In this talk, first we will introduce the basics of mirror symmetry, special K¨ahler geometry and BCOV holomorphic anomaly equations. We will then construct the special polynomial ring and sketch how to solve the BCOV anomaly equations using the polynomial recursion technique, by showing some examples.